Bali … it’s an idyllic paradise filled with rice fields, temples and frangipanis … unless you’re in Kuta, and then it’s a place of digestive upsets and Bintang-singleted bogans. Don’t go to Kuta. Go to Ubud. It’s a very special place an hour’s drive north of Denpasar, and I got the chance to go there for the Ubud Writers and Readers Festival in October. I ran a workshop for kids, I did a school session too, and I got to be on a panel with Mem Fox! The workshop was chaotic fun. The kids were from all over Bali, from other parts of Indonesia and from other countries too. Their cut-paper dragons looked awesome. They also did some drawings of their ideal dragon and decorated Viking helmets to take home. The next day I jumped into a minivan along with WA author AJ Betts, German graphic novelist Reinhard Kleist and Norwegian writer Anne Ostby to visit an international school in the village of Canggu. I spent the day with a year 5 class doing creative writing and cartooning. The lucky kids have a massive water slide park right next to the school – I imagine they have a pretty awesome swimming carnival. (As an aside, I bought two graphic novels by Reinhard: they’re awesome. He did a fantastic sketch in the front of both copies too). My only other commitment for the festival was a panel session on the ‘Strange Difficulty of Making Picture Books‘. On the panel with me were a Kiwi illustrator called Zak Waipara and only the most successful Australian picture book author of all time, the inimitable Mem Fox. I was very nervous (OMG MEM FOX!) but tried not to show it. I met Mem and our lovely MC Jeni Caffin in the green room beforehand. Mem was very warm and self-deprecating, and happily signed my childhood copy of Wilfred Gordon McDonald Partridge. It was a huge honour to be on a panel with Mem. And not to blow my own trumpet, but, well, I’m going to blow my own trumpet – at one point I spoke about the general plot of my picture book In The Lion and Mem said, “I love it! I wish I’d thought of that,” and I lost my tiny mind. You can listen to the full audio of our session below (I start talking about In The Lion at 38:30 and Mem says lovely things at 40:30). Ubud is a beautiful place to stay in Bali – hotels are nestled in lush vegetation, restaurants serve raw organic food, and there are yoga studios everywhere. One of the best past-times is scooter-spotting. 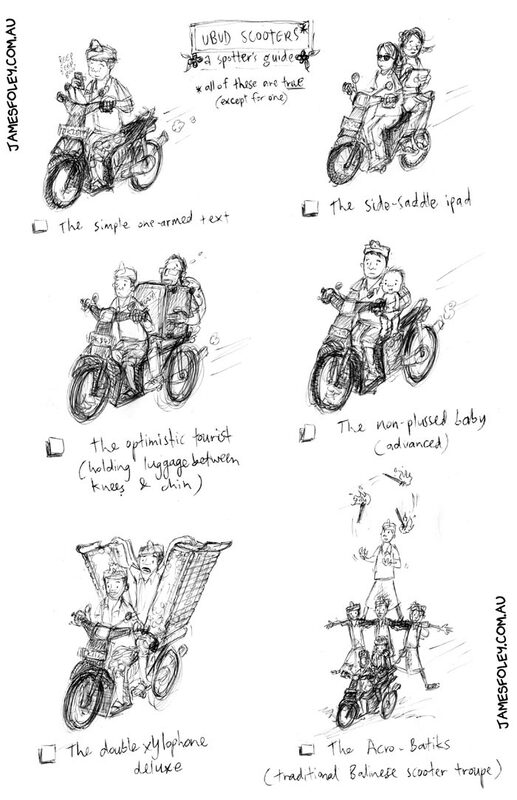 I’ve prepared you an ‘Ubud Scooters Spotter’s Guide’, sure to give you hours of fun. Huge thanks to the Ubud Writers and Readers Festival for having me; to Briony Stewart for suggesting me; and WritingWA for sending me. It was a brilliant experience and I’ll definitely visit again. Next Next post: What the heck happened to 2014?